This photograph is the first of four taken from a helicopter in the Summer of 1994 and is therefore the most recent. The prints are colour source material, hence the poor reproduction in black and white. We are looking due east towards Hastings at Sandrock and Five Acre fields from above Monkham inlet. 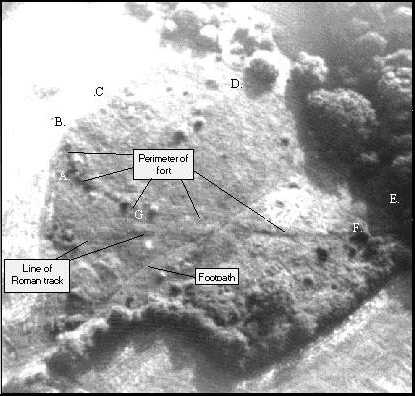 The Roman track running from top to bottom of the photograph is clearly visible, although the computer scanning lines running across the bottom of the picture should be ignored. 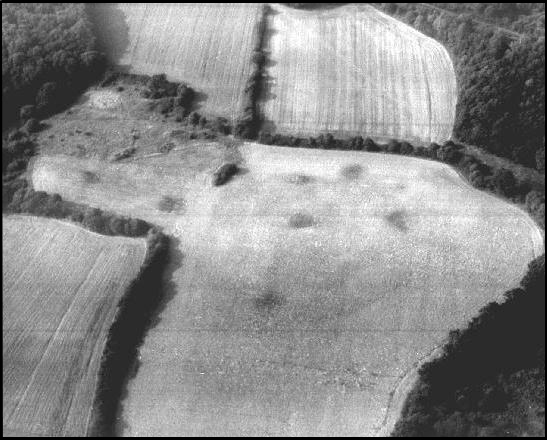 The dark patches in Five Acre field were clearly visible as dark brown patches and although not obvious from this reproduction were clearly visible on the day as being contained in a doughnut type circle on the ground. This appeared as an inner and out ring of slightly grey material spread throughout the soil. Fortunately the ground at the time had just been cleared and although the image was clear from the air the photograph does not do it justice. 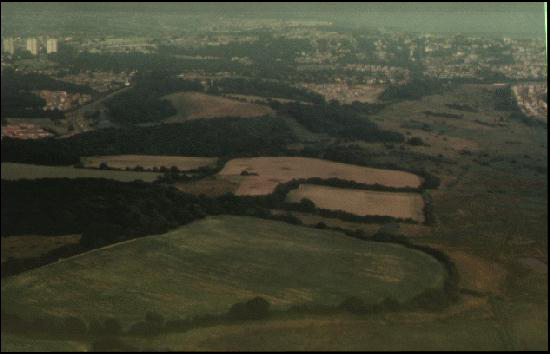 This shows the lower Norman fort area looking towards Bexhill in the south-west. The inlet can be seen in the top right with the first trees of Monkham Wood in the corner. Whilst the quality of the reproduction is poor it is still possible to see the distinctive shape of the ditch together with the line of the Roman track connecting the edge of Monkham Wood with the eastern port area. The circular light coloured feature next to the letter F. is a prominent mound and the letters drawn on the photograph mark the approximate perimeter of the fort. We have looked at a lot of aerial photographs, but none give a better view of the scale of the site than this one. It is taken looking east towards the metropolitan area of Hastings. The sea is in the background to the right and has bleached out on the black and white copies. The light coloured field in the distant centre is Five Acre Field, adjacent to the old port, edging onto the marsh. The field in the foreground corresponds to that shown on page 115 and even with crops in the markings of the early inhabitation are still evident from this distance. The advantage of seeing these fields in this context is to make the reader aware that the port and the landing site covered a huge tract of land, able to absorb the number of boats and men required to do the job. This photograph covers only about half of the site we are examining, bringing home the scale of the total site and putting a perspective upon how big the Combe Haven waterway would have been in 1066. 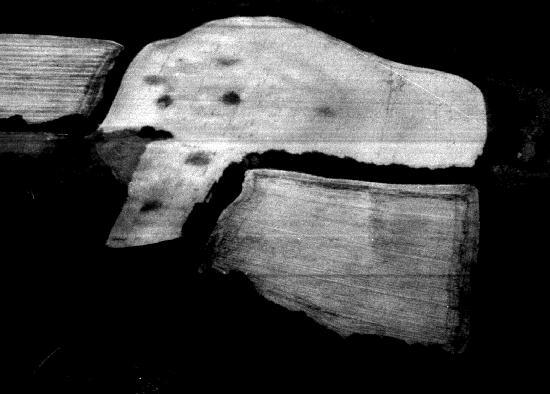 The last of the aerial photographs gives a better picture of the “Saxon doughnut” as it appeared to me on my 30 second flight around the site in the Summer of 1994. The grey scale has reduced the visibility on the black and white prints, due to the different shades of brown being interpreted by the computer as similar greys, whereas the human eye can make great differentiation in colour. None the less these photographs provide conclusive evidence to even the untrained eye that these are no ordinary fields. The record shows that they have been in agricultural use since 1086 (134)and yet clear markings of human habitation still exist today. The only conclusion that this can support is that the claims made in this document are possibly true and therefore must be investigated by archaeologists with the necessary qualifications. After all this is no ordinary claim, it is a claim that hits at the heart of our English heritage and appears to be backed up by real evidence, both written and physical. Could anyone afford to ignore the possibility that here in the heart of rural Sussex lies an archaeological treasure of such significance, hidden for almost a millennium? At this time there is no archaeological record of the actual Invasion, only the subsequent occupation. Now I shall put before you the evidence to support the conclusion that it awaits discovery.